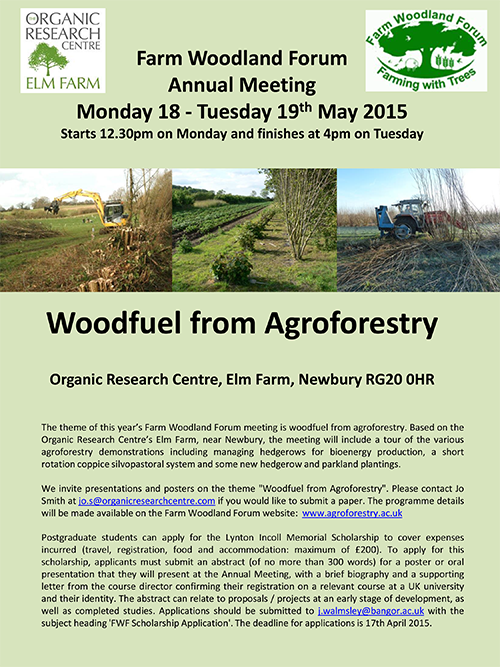 This year’s annual meeting of the Farm Woodland Forum will be held at the Organic Research Centre, Elm Farm near Newbury, Berkshire, starting at 12.30pm on Monday 18th May and finishing at 4pm on Tuesday 19th May. The theme is Woodfuel from Agroforestry. Based on the Organic Research Centre’s Elm Farm, near Newbury, the meeting will include a tour of the various agroforestry demonstrations including managing hedgerows for bioenergy production, a short rotation coppice silvopastoral system and some new hedgerow and parkland plantings.